Have I told you how I love summer? Coming from a tropical island, Puerto Rico, I love the warmth of summer and all it entails. Going to the beach, outdoor activities and of course casual impromptu get togethers with cocktails! You can throw a last minute cocktail party so effortlessly your friends will think you are an entertaining goddess. That is exactly what we did last weekend and we thoroughly enjoyed ourselves. My husband, David, and I decided on Sunday that we would have a cocktail party that afternoon. David works Monday thru Saturday so Sunday is the only day that we have a little extra time to enjoy with our friends and family. We tidied up pretty quickly that morning and then left to go over to my parents. My parents were attending a friend’s wedding and I was going to do my mama’s makeup. I have written before about doing your mama’s makeup. You can read that post here! Since the wedding was outdoors and at 3:30pm I decided to do a Summer Dewy Look. You can see all the beauty products used and how to recreate it here. Let me tell you she looked gorgeous! We took them to the wedding and when we returned home we called and texted some friends inviting them over. As this was last minute it was comfy attire, shorts and flip flops welcomed! We even encouraged one of our friends to come as you are since she was still in her jammies but she decided to change. So first things first, tidy up! I know they’re your friends but take a little bit of pride in the presentation! There is just such a pleasant feeling of enjoying your home when it’s clean and organized. You want the afternoon to be stress free so go the simple route. I had been to Trader Joe’s earlier that week and had picked up a few yummy items. I love Trader Joe’s! They are easy, convenient and inexpensive. We served a light and crispy flat bread with caramelized onions, ham and gruyere cheese and some pastry bites with feta cheese and caramelized onions. Pop in the oven y ya! We also served some prosciutto with some Spanish cheese tapas sampler, consisting of some Manchego, Iberico and Cabra al Vino. I love tapas, small bites, since you get to taste a little of everything. We placed a slice of prosciutto over a slice of cheese and some figs or dates over the prosciutto. Yum! We also had some grape tomatoes, roasted cashews and some sliced plums. Everything was light and easy to serve. I love color! Our china was a wedding gift from our registry and we love it! We picked it because we wanted our everyday meals to be bright, cheerful and fun. You should enjoy your day to day in style and these sure do the trick! We also used a gold platter. The glasses were also a wedding gift and they are simple tumblers allowing the beverage to be showcased. The easiest way to keep it simple and stress free. Baileys Almande is Baileys newest Almondmilk Liqueur made from sweet almond oil and almond essence (extracted from crushed almonds), cane sugar and purified water with a touch of real vanilla. It is Gluten Free and contains no dairy. It is light and perfect for a hot summer day! This bottle is gorgeous with beautiful pink flowers and gold details. We decided to serve it two different ways: over ice and blended. Remember, the reason you are having a cocktail party is to catch up with friends and share and enjoy your time together so involve them in the process and make the cocktails together. It takes the pressure off of having everything perfect and allows you to be able to enjoy their company. I’ve included those recipes below plus a few more for you. Salud! 1. Combine Baileys Almande, Vita Coco, fresh raspberries, agave nectar and ice into a blender. Blend until smooth. 2. Pour contents into a highball glass. Mai-Tai Interest You In Some Almande? 1. Combine Baileys Almande, Vita Coco, white rum, fresh watermelon, and ice into a blender. Blend until smooth. We truly enjoyed our afternoon sipping these delicious cocktails with Baileys Almande. Our friends told us they had seen an ad of Baileys Almande and were looking forward to trying it. They were so excited to be able to do so. Everyone really liked the sweet almond taste and preferred it served with coconut water over ice. It’s been in the 90’s here in Austin and this drink was perfectly light and so refreshing. 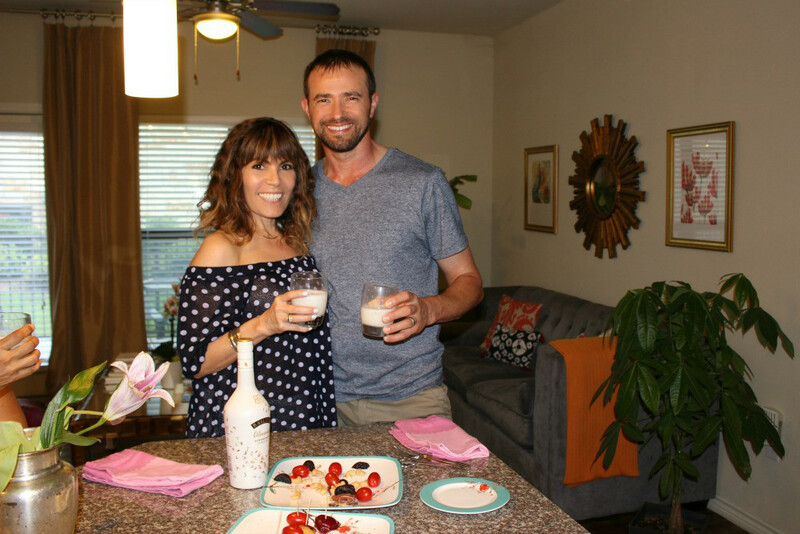 We loved the hint of vanilla and I especially appreciate the fact that it is gluten free and dairy free, I have hypothyroidism and try to limit gluten and dairy to feel my best. We caught up on what’s going on in our lives. One of our friends is going on a trip and she was telling us about this new adventure. There is so much involved in an infant adoption and we are so grateful for the support of our dear family and friends but also grateful for the birth mother that will choose us as the adoptive parents of her child and her selfless act, thinking of the best future for that child. We look forward to meeting you soon. We had our cocktail party inside with the AC on but moved the party outside to our patio. It is summer after all and why not enjoy the outside when it starts cooling down? I love dining al fresco. You can read about 5 Key Elements To Dining Al Fresco here. We ended our evening talking about music and watching a local artist’s youtube video. Austin has tons of outdoor activities during the summer and most of them are Free! I guess we will have to go check her out! Thank you Baileys for the delish Baileys Almande and congrats on the successful launch! Of course Baileys Almande cocktails were so divine we finished the bottle. I can only imagine how delicious Baileys Almande would taste in coffee! Baileys, I think we will have to host a brunch! This post was sponsored by Baileys but all opinions are my own. Are you ready to have a last minute cocktail party? Tell us in the comments.